When it comes to investment in Real Estate be it commercial or residential vs investment in Stock Markets, 99 percent of the people in India would go with the former as the later has very scary track record of significant capital erosion during past half a decade. 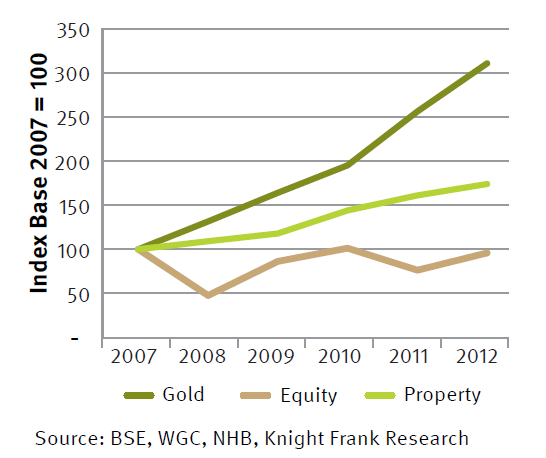 Stocks inherently are very risky but historically has a track record of outperforming any other asset class by huge margin over 10 year period or more.But since 2008 equities in India has delivered negative returns while real estate and gold has delivered huge inflation adjusted returns thereby attracting more and more people towards them. 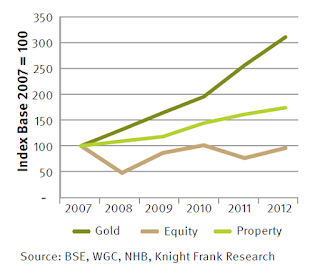 According to the latest study by real estate research firm, Knight Frank, property investment has yielded 74 percent returns, while investment in equity, as measured by Sensex, has lost money and gold has yielded a massive 210% return during this same time frame. As seen in the graph above, during 2007-2012, equity lost a lot of money due to the financial crisis in 2008.